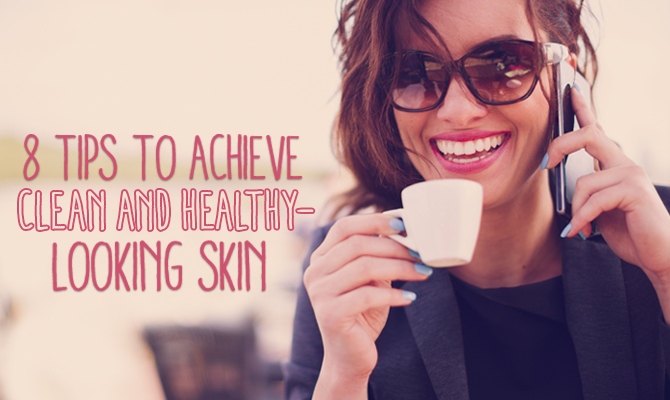 Keep your skin looking at its absolute best with these helpful tips. When it comes to achieving clean and healthy looking skin, following a daily regimen is key, but there are little changes beyond washing your face you can make that you may not have thought of. Here are some tips you can implement for immediate results. Every time you touch your face, chances are you’re transmitting dirt, oil and germs onto your skin. So, a hands-off approach is best. This rule also applies to pimples. Try to resist the urge to pop or pick at them, or it could lead to infection. When it comes to keeping your skin clean, changing your pillowcase as frequently as possible is important. When you sleep at night, your hair and skin are in direct contact with your pillowcase. Your natural hair oils, and hair products if you use them, are transferred onto the pillowcase and ultimately end up on your face. Use a clean pillowcase each night, and if frequent laundering isn’t an option, turn them inside out or flip your pillow over to help keep impurities from collecting on your skin. If your phone is touching your face, there’s a good chance it’s depositing germs onto it. Clean your phone on a daily basis using a spray hand sanitizer or antibacterial wipe. You can also get in the habit of using your speakerphone or headphones to avoid contact. Your hair is layered with oils, any products you may use on it, and it also catches debris that it comes into contact with. These impurities can transfer onto your face, resulting in a breakout. The solution is to keep your hair pulled back from your face as often as possible, especially when you’re at the gym or in bed. Sleeping in makeup can cause your pores to become clogged and lead to acne breakouts. It can also cause dry skin, redness and irritation. Be sure to thoroughly cleanse your face of all makeup products, including eye makeup, each night before bed. Skin care products that contain alcohol tend to dry out the skin. If you’re already prone to dryness, the result can be dry, flaky and even chapped skin that makes you look older. Look for alcohol-free products that will be much gentler. If you apply your makeup and then blow dry your hair, your makeup can melt. Then, when it dries, it can settle into your pores, causing them to become clogged. Do your hair first and you can avoid this problem. Breakouts can occur on areas of your body other than your face, including your back and shoulders. To keep the skin on your entire body clean, be sure to wash from head to toe and use a moisturizer. Additionally, after a workout, try to change out of your sweaty clothes immediately, even if you don’t take a shower right away. And always pat your skin dry with a clean towel. Never reach for the family hand towel. If you’re interested in treating acne and blemishes, remember to use products formulated and labeled as anti-acne products. Remember that the healthiest skin is always the most beautiful.